The unit has a tenant paying $590 a month, the lease is until Dec 31st 2014. This gated community has a wide range of amenities including a fitness center with indoor racquetball and a yoga room. It also features two sparkling swimming pools and spas along with a tranquil lake, sand volleyball, and two tennis courts. 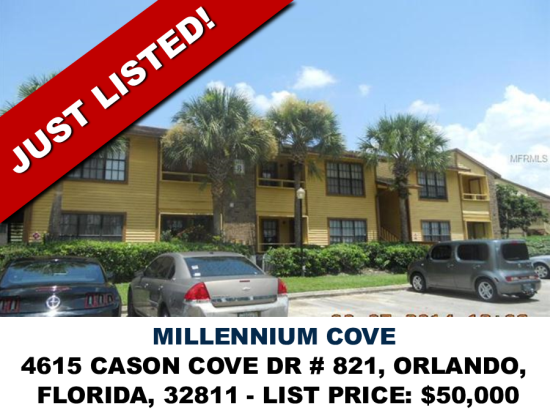 Millenium Cove is conveniently located near all the major attractions Orlando has to offer. Just minutes from Disney World, Universal Orlando and Sea World and ideally located near the finest shopping in Orlando including the luxurious Mall at Millenia and The Prime Outlets. AMENITIES: Gated Community, Fitness Center with Yoga Room, Indoor Racquetball Court, 2 Tennis Courts, 2 Pools & 2 Spas, Sand Volleyball Court, Tranquil Lake & Preserve Views, BBQ & Picnic Areas, Dog Park, Playground, Car-Care Center.